WWII Days – Rockford, IL | ¿Qué Onda Guero? 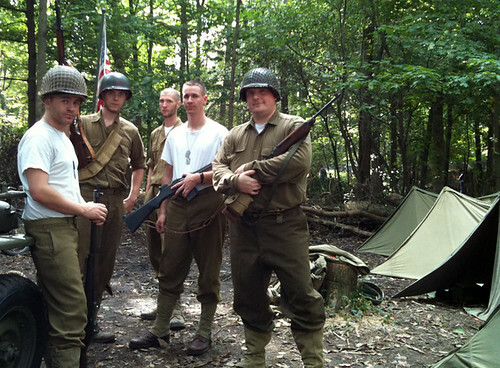 Once a year, 600-700 German, English and American soldiers gather for a weekend to reenact WWII battles and encampments. The event is hosted at Midway Village Museum, a living history museum located on 137 acres in Rockford. It’s a totally immersive experience. You can get up close and personal with WWII era tanks, weapons, soldiers in full WWII dress, encampments and live ammunition fire. Okay, I lied about the live ammunition. But it’s a really awesome experience and I highly recommend you go out and visit. It’s fun, educational and the soldiers love interacting with the visitors. Check out Midway’s site for more information. They’re only out there for one more day, so if you live within an hour or so of Rockford, it’s well worth the drive to spend a beautiful fall day outside appreciating history. Pictured below are a few guys from the US 90th Infantry Division. My good friend Don is on the right, in the center of the image. Click the image to see my other photos on flickr. Unfortunately, all I had with me was my iPhone so the photos aren’t as crisp as they could be. This entry was posted on Saturday, September 26th, 2009 at 10:25 pm	and posted in Uncategorized. You can follow any responses to this entry through the RSS 2.0 feed. World War II Days in Rockford « ¿Qué Onda Guero?